Go to Andiamo for elevated brick-oven pizza with a unique indoor-outdoor setting in what resembles a glass-walled drive in. 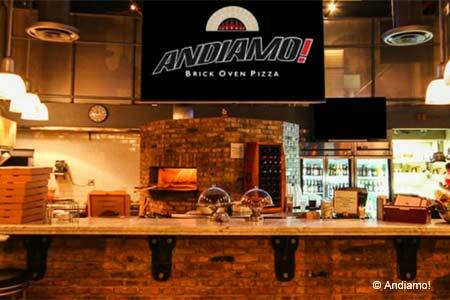 : Andiamo shares a building with a long-established car wash that found a little space to accommodate this warm and inviting pizza spot off Biscayne Boulevard. Downtown office workers make Andiamo a hot lunchtime destination where they can sit comfortably at an outside patio shaded by trees and enjoy a bay breeze while biting into an entrée salad, panino or pizza with a thin but substantial crust. Pies range from the standard Andiamo version with mozzarella and fresh basil with merely a swab of sauce, to the hearty homemade meatball number accented with sautéed onions, roasted peppers, and provolone and Parmesan cheeses. With a small wine list and a more expansive beer menu, Andiamo emphasizes Miami's distinctive version of urban living: easygoing and out-of-doors.